Can the Yankees Hire Mike Gallego Already? 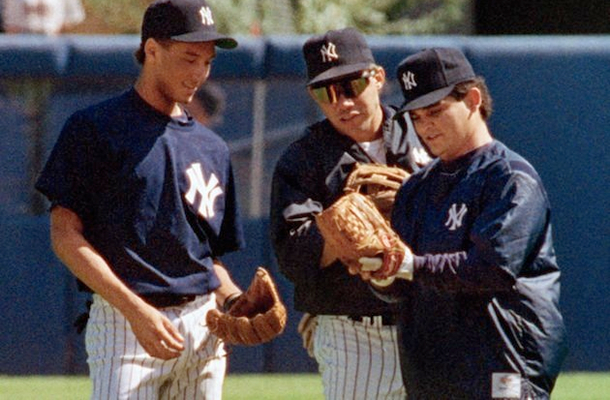 I was watching the 30 for 30 about the San Francisco earthquake and the 1989 World Series today, when I unexpectedly reconnected with one of my favorite Yankees from the 1990s–Mike Gallego. Gallego, who was interviewed for the documentary (along with several former players) was a Utility Infielder with the A’s that year, and was enjoying playing in his second straight World Series. Anyway, all that Gallego made me realize that I miss the little guy, and that the Yankees need to poach him from Oakland and use him to fill one of the base coach boxes in the Bronx. Bring back Mike Gallego! Now, I may be advocating collusion the likes of which got former Rays manager Joe Maddon to quit Tampa Bay and sign with the Cubs (I mean seriously. The guy quit his job out of nowhere and suddenly had a high profile job just five days later? Come on now. ), but hear me out for a second. Gallego has been the Third Base and Infielders Coach for the A’s, the team with which he spent the first seven years, and eight overall, of his 13 year playing career. He clearly has the experience needed to coach third base for the Yankees, and his infield defense expertise would also be much needed on a Yankees team that looked like the Bad News Bears at times in 2014. He’s also a fun face from the past, having spent three seasons with the Yankees in the early 90s. Some of you will point to the fact that the Yankees already have Rob Thomson, the Third Base coach for the Yankees since 2009 who somehow kept his job after a brutal 2014 season, under contract. Get out. Just stop reading right now, because you don’t know anything. “Windmill” Thomson was so bad that old Jobu might as well have been coaching third for the Yankees last year, and I don’t even have movable arms. Actually, with all the guys Thomson caused to be thrown out at the plate in 2014, maybe stationary arms would be an advantage for me. Anyway, the point is, Thomson is terrible. I don’t care how many compromising photos of Joe Girardi he has (how else is he still employed? ), he needs to go… Or at least coach something else. Like the equipment bags. I know you’re saying to yourselves… Why are you even writing this article? Who cares about Mike Gallego, or even the coaching staff, when we have so many holes to fill on the actual playing roster? Let’s be serious here. The Yankees don’t seem on the verge of doing anything big (although the Max Scherzer speculation has begun). The coaching staff might be all we got right now. Plus I don’t feel like writing about A-Rod. Bring back Mike Gallego now, Cashman! Jobu is going on a hunger strike until it happens… I’m gonna need a lot more rum.